The word "couch" comes from the French coucher, which means "to lie down." Whether used for lying down or sitting upright, the couch has a long history going back all the way to classical Greek and Roman times. Use this list to identify a number of some common types that antique furniture fans are likely to run across in their adventures. The boudeuse (pronounced boo-duhz) is a type of small upholstered sofa or loveseat of sorts, consisting of two seats sharing a common back so that the sitters face in opposite directions. Developed during the mid-19th century, probably in France, it is characteristic of ornate and luxurious Second Empire furniture, and usually employs coil-spring technology in the seat. It is also known as a dos-à-dos ("back-to-back" in French). The French word boudeuse translates as "sulky"—typical, perhaps, of the mood of a pair of lovers who chose to sit facing away from each other on this type of seating. Leg and foot styles vary, depending on the exact period. Cabriole legs are typical on Queen Anne and Chippendale pieces, while tapered legs characterize those in the style of Hepplewhite (whose designs the style is often connected to), and elaborately carved monopodium feet often adorn Empire pieces. This style is sometimes described as a "humpback" sofa. 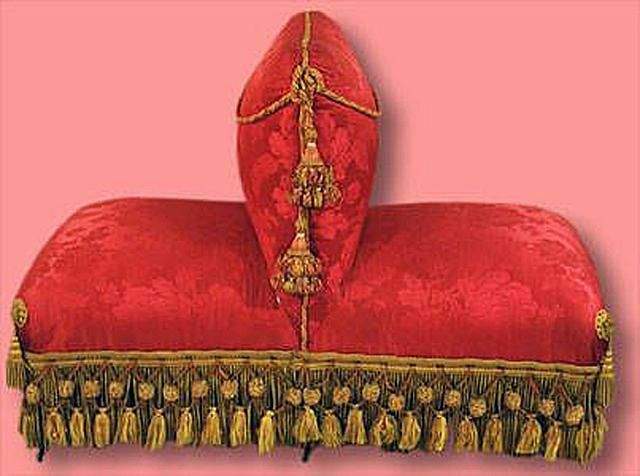 The Canapé à Confidante (pronounced kan-a-pay ah kon-fee-dahnt) is a long sofa having a seat at each end that faces outward at right angles to the main seat. The style was developed in 18th-century France reflecting the development of new types of furniture at that time. It is characteristic of Louis XV and rococo styles, as well as the mid-19th-century revivals of those styles. It is intended as seating for at least three people, not unlike an indiscret, except that the center section is usually much longer than the two side seats. This is a type of seating in which the backrest is composed of two, three, or even more distinct chair frames so the effect is that of a series of chairs sharing a common seat. An early type of couch, it was developed in the late 17th century and continued to be popular well into the 19th century with the backs, legs, and feet reflecting the predominant styles of the period. The back chairs are usually open but can be upholstered. It is also known in French as a canapé en cabriolet. This style is experiencing a modern comeback among do-it-yourself project fans who are combining thrifted individual chairs with interesting backs into settees. A Chesterfield is a type of deep, completely upholstered sofa with rolled arms that are the same height as the back which form a single rolling curve. It is traditionally crafted with tufted, buttoned leather, though other fabrics can be used. This sofa style originally rested on blunt arrow feet, but later models were stubbier, resting on ball, bun, or block feet. It originated in England in the late 18th century. Legend has it was named for the trend-setting Earl of Chesterfield, who allegedly commissioned one. It is typically associated with mid-19th-century Victorian styles, flourishing with the development of coil-spring technology in the 1830s. Plush and plump, the Chesterfield sofa—like leather club chairs and wingback chairs—is an article of furniture that speaks of sumptuous libraries and gentlemen's lounges. In the U.S., a Davenport originally referred to a squarish sofa, usually upholstered, with a high back and arms. The boxy style developed around the turn of the 20th century and was named for the A.H. Davenport Company of Boston (later Irving & Casson & Davenport), a firm also known for manufacturing furniture designed by architect H.H. Richardson. Although somewhat archaic now, the term became generic and was applied to almost any sofa or couch in the Midwest and upstate New York. It was popular enough so that, when convertible sofa-beds were first developed, they were called "Davenport beds." The Kroehler Company of Naperville, Illinois, was the first to patent a sofa with hidden mattress and springs in 1909 though earlier versions may well have existed. A Davenport also references a type of small, portable English desk and the term largely references the desk style in modern terms. The indescret (pronounced en-des-cray) is a type of upholstered couch that can seat three people. It was developed in the mid-19th century, probably in France, and it can take two forms. The earlier, dating from the 1830s, is a circular sofa, divided into three sections that share a single tall back in the center. The later, which emerged during the Second Empire, consists of three connected armchairs in a pinwheel pattern like the example shown here. Both types are often ornately carved, with tufted upholstery that uses the coil-spring technology so dear to Victorian hearts and furniture styles alike. This style is sometimes aptly called a conversational sofa, and may erroneously be identified as a tête-a-tête which only seats two people. This type of daybed, a cross between a sofa and a chaise lounge, is characterized by a sloping back that runs along the length of the piece and connecting the high headrest and footrest (though some versions are open-ended). Legs can vary in shape but the headrest and footrest, when present, are typically scrolled or curved. Developed in the early 1800s, the méridienne (pronounced may-rid-ee-ehn) is typically associated with English Regency and late French Empire, though its popularity continued throughout the 19th century and beyond. The récamier is a variation. These are sometimes referenced as Grecian daybeds or fainting couches as well. A récamier (pronounced ray-cam-ee-ay) is a type of light daybed that can double as a sofa. It has a curved headboard and correspondingly scrolled, but usually shorter, footboard. Originally backless, later versions often sported a low backrest, sometimes sloping, that ran either all or partly down the length of the piece. Developed in France in the 1790s, it was named for Madame Récamier, a Parisian hostess and style-setter pictured reclining on one in a framed portrait. It is characteristic of French Directoire/Empire, English Regency, and American Federal styles. The méridienne is a related style. These are sometimes referenced as Grecian daybeds or fainting couches more generically. A type of settee that is basically two chairs joined together. They are conjoined in a serpentine shape so that the two people occupying it face opposite directions, but are quite close and can easily see each other in profile (the French phrase "tête-à-tête" refers to an intimate conversation). Developed during the early 19th century, the tête-a-tête (pronounced tet-ah-tet) is usually associated with ornate Victorian furniture styles and often uses the coil-spring technology developed in the 1830s. Mid-Century Modern versions were also made by designers Salvador Dali and Edward Wormley. These are sometimes called a confidante, vis-à-vis (face-to-face) , or gossip couch, all names suggesting private chats. This is a variation on the Windsor chair: a long bench with a back and sides that consist of multiple spindles inserted in holes in the base of a sunken, often saddle-shaped seat. This settee typically has six legs which are also inserted in holes in the seat and are often splayed and connected with H-stretchers; these can be turned, carved to simulate bamboo, or tapering to end in a simple or arrow foot. Arms might be S-, paddle-, knuckle- or L-shaped. The spindled backs of the settees come in various shapes, similar to those of the chair (sack-back, bow-back, etc.) Straight low-backs seem to have been especially common. Another typical variation was the arrow-back, which refers not to the shape of the back but the spindles themselves, which were tapered and flattened at the end to suggest arrows. Windsor settees were often made of different types of wood and so they are usually painted—sometimes quite elaborately, not unlike some fancier side chairs. They seem to be primarily an American form, developing in the 1750s most probably in Philadelphia.